Golfing in Barbados ranges from world championship quality courses to the kind of course for the beginning golfer. Here are the most well known golf courses in Barbados. Sandy Lane Resort and golf club, here you can choose from three courses all with their own unique challenges, the Old Nine, the Country Club Course or the Green Monkey Course. The 2 latter courses were both designed by Tom Fazio. 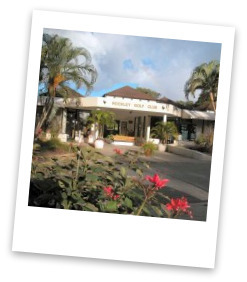 There are other facilities available at Sandy Lane including restaurant, spa, tennis and childrens club and water sports. Tiger Woods, one of the most famous golfers of all time got married in Barbados at the Sandy Lane Golf Club making quite a stir amongst the local golfers. 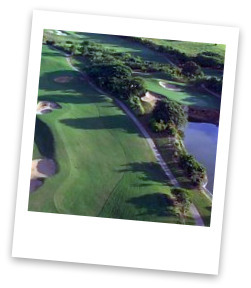 The Barbados Golf Club, was Barbados' first public golf course, the 6,805 yard par 72 golf course has magnificent trees that were strategically planted about 25 years ago and give the golf course a mature ambiance. There are two lakes that make play very interesting on five holes and make holes 15 and 16 extremely challenging. 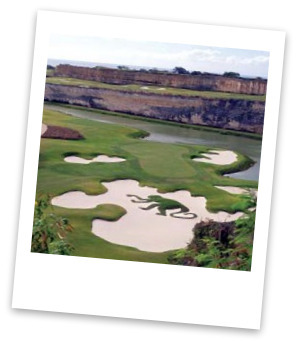 A number of coral stone bunkers carved among four holes add to a challenging golf course. Ron Kirby was the golf course designer that designed the course, making it a challenging course to play. Royal Westmoreland golf club, is a challenging course offering some of the best par three golf anywhere. It's a members only golf club but it does allow guests, it also offers special arrangements with some hotels such as the The Fairmont Royal Pavilion. It was designed by Robert Trent Jones, Royal Westmoreland is also one of the world's most exciting resort courses, complete with a spa, tennis, restaurants and golf villas. The Rockley Golf Course is the oldest Golf Club in Barbados located on the beautiful South coast of Barbados, it's a 9 Hole (with alternative tees for the back nine) par 70, 5610 yard course. Rockley is ideally set up for all ages and caliber of golfer. The first hole looks easy but with the pin positions laid out the way they are it takes all your ability to make it. Rockley's most difficult hole is the 5th a 456 yd par 4 it has a narrow fairway and a sloping green that has strategically placed bunkers. Some of the services the club provides are a well stocked pro-shop and a bar and restaurant that has to be one of the friendliest club bars in Barbados. This is golfing in Barbados for those that want to kill time rather than those wanting a challenging game. Almond Beach Village has a 9 hole par 3 recreational golf course located on the property, it's more for hotel guest relaxation than a challenging golf course. Lessons with a golf pro can be arranged for those wishing to get into the swing of things. The list of golf courses presented here range from the most challenging to entertaining. It will be interesting to see what the new projects that are now in the planning stage will bring to golfing in Barbados in the near future.